Here’s a clever idea. 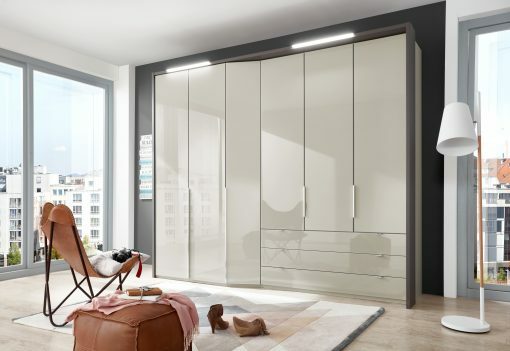 It helped this fabulous range win an industry accolade of Bedroom of the Year at its UK launch in 2018. A sneaky little angled extra cupboard which creates a tiered link between wardrobes of different depths. That means you might be able to squeeze a little more storage space than you thought into a room and around the bed. Or you just fancy that little break to a long run of wardrobe doors (and drawers, there are robes with long drawers in this range too). You can have the angled door opening to the left or right and combine it with single or double doors robes either side – all with the super cool soft closing feature that’s standard to our VIP ranges. Cayenne comes in a choice of four gorgeous colours – white, champagne, smokey havana or pebble grey – for door fronts there’s a choice of mat or glass finish – plus mirrors of course. Inside there’s the VIP smart grey-striped interior and, of course, lots of handy storage fittings to choose from. Our Tokio range can provide plenty of freestanding furniture to match to complete your Cayenne bedroom.